Apple may be seriously looking into the technology of wireless charging as a new patent shows up in a recent application that would embed inductive charging inside the Apple smart cover designed for iPads. This is a different take than what we have typically seen for a wireless charging design for the internal rechargeable battery. Instead of being tethered directly to a power source, it appears that the Apple Smart Cover itself, would have battery cells of some type inside each panel. This would enable the cover itself to recharge the internal iPad battery when not in use, however it also brings the potential situation that you now have 2 items to recharge. It was not mentioned what the recharge time might be via induction vs simply plugging the device in, but this would enable a much longer lifespan of usage when away from power for extended periods of time. Perhaps the ability to recharge via induction the Smart Cover is a possibility, when the iPad is plugged in itself? This would save the end user from having to remember to separately charge 2 unique devices. “ Charging occurs when the flap is covering the display, thus signaling that the device is not in use. Other embodiments describe methods in which the iPad can determine its own battery state and enable the inductive charging circuit when in “portable mode,” or not plugged into a power source. Current iPads do not had this capability at this time, and highly likely could not be retrofitted for use. This is very interesting feature that we may see down the road if Apple decides to go forward with the technology. Aside from iPad cases, you aren’t likely to find a wide range of useful iPad accessories, thanks to an ever-increasing number of innovative apps and features. Electronics accessories have always been a kind of “micro-market” surrounding the world of computers and gadgets. For every one Apple, HP, or Blackberry, there are literally hundreds of accessories designers and manufacturers, ranging from the predictable to innovative, and from cheap to expensive. It is, to be sure, a parasitic industry that relies on a fresh, steady stream of new gadget wizardry to stay afloat. However, over the past few years, gadget users have shied away from investing in accessories. Electronics accessories designers have produced hundreds of iPad cases for the burgeoning iPad market. But fresh rumors of a smaller, mini iPad for early 2011 has them scrambling to keep up. Apple’s announcement of the new iPad in January of 2011 put the electronics accessories designers on red alert. They had very little time to design and produce iPad cases that would work with the iPad, and as a result, many of them simply retro-engineered iPhone 4 cases to work with the iPad. Since that time, most iPad case designers have been playing catch-up with the iPad. Only now are we starting to see really interesting iPad case designs. Ever wonder if all of the iPad cases that claim to be waterproof actually live up to their claim? This YouTube reviewer put his iPad case to the test and sprayed it with a hose – with his iPad inside! There’s nothing that poses a bigger threat to your iPad than water. Apple does its best to build sturdy, rugged gadgets that can survive drops (both the falling and water kinds) by using strong PC polycarbonate plastic housings and tight assembly. But the bottom line is this: if moisture gets inside your iPad, it’s fried. Add to this the fact that the iPad spends a lot of its life outside, and you can start to realize how a waterproof iPad case is an attractive idea for many iPad users. But do you ever wonder if supposedly “waterproof” products, such as iPad cases, really live up to their own claims? After all, how many people are ever really going to put their waterproof iPad case to the test and risk ruining their iPad? Well, this crazy YouTube tech reviewer did! Zain Sehgal, also known as “iglaswegian” on YouTube, actually took a garden hose and sprayed his Uniea Omniverse iPad case with water – while his iPad was in it! Is he crazy? Brilliant? You decide. 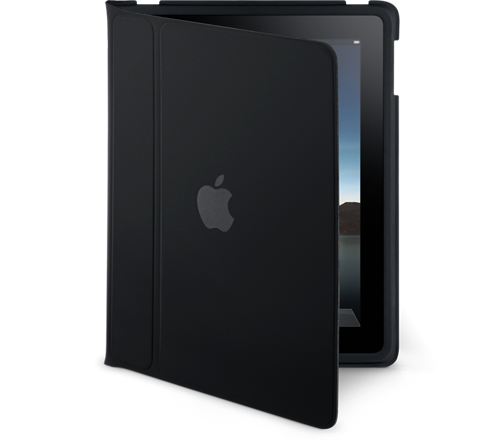 New iPad 4 case designs continue to pop up on the consumer electronics market each month. But how much influence does Apple’s own homegrown iPad case have on other companies’ designs? You’ve probably read all about Apple’s recent iPhone 4 snafu, and how Steve Jobs has generously given all disgruntled iPhone 4 buyers a free iPhone case. Nevermind that the free iPhone bumper probably costs about .4 cents to produce — I’m sure that a bit of silicone rubber will make the new iPhone’s shortcomings disappear in the minds of Apple disciples. But there has already been enough written about the iPhone 4 to fill the blogosphere for years. Instead, I’m wondering what kind of ripple effect that Apple’s now-free, el cheapo iPhone 4 case will have on the rest of the new iPhone 4 cases due out for the remainder of 2010? 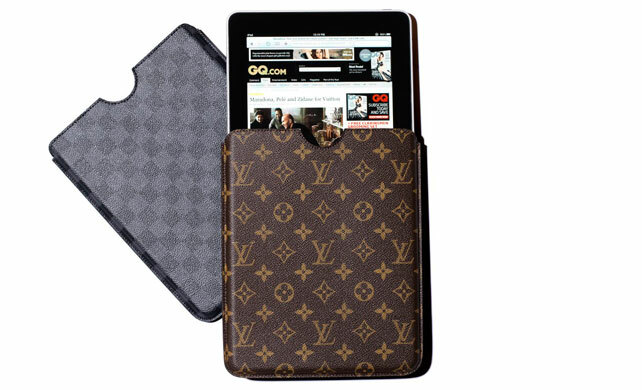 New Louis Vuitton iPad Case Begs the Question: Is the iPad a Status Symbol? There’s an iPad case for everyone on the market today, but is a designer iPad case that costs almost as much as the iPad itself really necessary? Louis Vuitton, the heralded, hallowed designer handbag maker, recently made news in both the fashion and tech world with the announcement of its new iPad case. Clad in its trademark Louis Vuitton leather print, the simple leather iPad sleeve will retail for around A$ 420 ($366 USD). While Louis Vuitton isn’t liberally shipping out review samples of its designer iPad case to tech reviewers such as myself, a quick look from an expert eye reveals a complete lack of any features, protective or otherwise. Basically, the Vuitton iPad case is just a big slab of status symbol — a case for either a spendthrift who is desperate to wallpaper themselves with as many designer brands as possible in order to impress their family, friends, and passersby, or for the desperately wealthy class who would never even consider an iPad case that didn’t have LV’s print or Chanel’s interlocking Cs emblazoned on the front. When Steve Jobs famously said, “We don’t know how to build a sub-[USD]$500 computer that is not a piece of junk,” the tech media unanimously interpreted this to mean that Apple would never get into the netbook business. After all, what is a netbook? Essentially is a small, compact mini computer that is constructed mainly for the purposes of surfing the ‘net, checking e-mail, social networking, and light gaming. However, there is nothing innovative about the netbook design — it only exists because, more important than any of these defining features, netbooks are usually really cheap. Thus, they were developed not as product leaders in the tech market, but as price leaders; they give people an opportunity to enter the computing world on a shoestring budget.